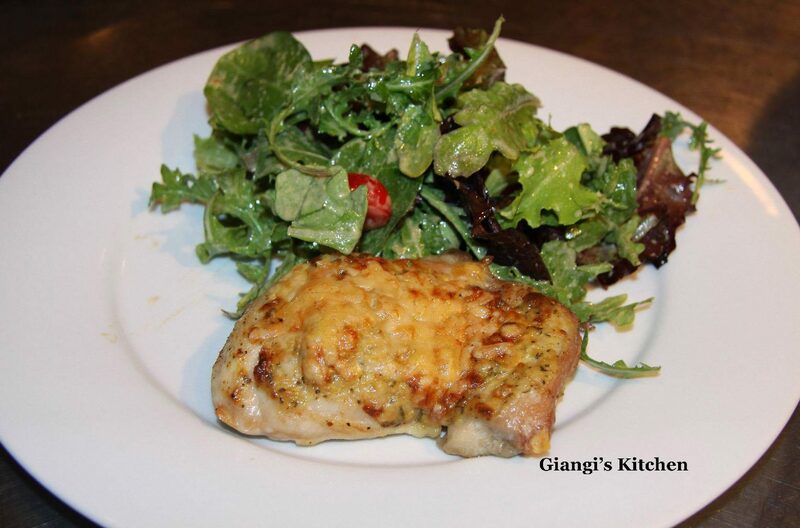 Pecorino crusted chicken with arugula and mixed baby green salad. It’s a gorgeous Sunday morning. The windows are opens and the crisp air fills the rooms. The birds are singing welcoming a new day as I admire the gorgeous full moon that is still gracing the sky with her presence. I love this time of day. The house is still so quiet, perfect time to plan my day and week, time to catch up. We had a busy week and a couple of nights ago we prepared this new dish, Pecorino Crusted Chicken with Arugula and Mixed Green Salad. Fast, great flavors blending well together and the salad is a must. Crisp and bitter arugula mixes well with the baby green that are a bit sweet and with the mustard …. I am letting your taste buds enjoy the combination. Preheat oven to 475°. In a small bowl, whisk 2 teaspoons of the mustard with 2 teaspoons Of the olive oil and they thyme. Season the chicken with salt and pepper then brush with the mustard mixture all over. Pat 2 tablespoons of the pecorino and Gruyère cheese mixture all over the chicken thighs. Transfer the chicken to a rimmed lined with aluminum foil baking sheet. Bake the chicken on the top shelf of the oven for about 15 to 18 minutes, or until cooked thru and nicely browned. In a bowl combine the remaining olive oil and mustard and stir in the water. Add the arugula and the tomatoes. Season with salt and pepper and toss well.